2018 Study On Food Consumption Trends In The U.S.
Over the years, healthy foods have evolved from passing fad to mainstream movement, representing a lifestyle that’s more about conscious consumption. Findings from L.E.K.’s 2018 consumer food and beverage survey of nearly 1,600 consumers show that they want health claims to be more nuanced and convey specific attributes. In addition, consumers are seeking an increasingly diverse array of benefits from their food and beverages. We also found that more than ever before, consumers are willing to pay for food that delivers on its claims. Today’s consumer is a committed or casual supporter of nearly a dozen health and wellness claims — 20% more than in 2016. People haven’t always thought very hard about their food. For most of human history, simply getting enough to eat was job one. This began to change with the advent of health food, as it was called, around the turn of the 20th century. The rise of organic farming soon followed. Still, it wasn’t until the early 1970s — when food prices spiked amid heightened concerns about environmental health — that natural foods started to gain traction as a cultural and commercial phenomenon. Today, the movement has gone mainstream. From warehouse clubs to supermarkets, from dollar stores to drugstores, foods that profess to boost health and wellness have staked their claim on the retail shelf. Along the way, such foods have become upscale, representing a lifestyle that’s less about counterculture than about conscious consumption. Consumers’ bar is rising. They want to know more than whether a product is low-calorie or high-fiber. Claims need to be more nuanced and convey specific attributes relative to health, wellness, ethics and the environment. Consumers want more. Rather than gravitate to a handful of popular trends, consumers are seeking an increasingly diverse array of benefits from their food and beverage consumption. Consumers see the value. More than ever before, consumers are willing to pay for food that delivers on its claims. To understand these findings better, let’s take a closer look at what survey respondents tell us about their attitudes and preferences regarding healthy, sustainable food and beverage products. Health and wellness is no fad. It’s an enduring desire that turns up time and again in our studies, one that people bring every day to the purchases they make. Of this year’s nearly 1,600 survey participants, fully 93% say they feel compelled to eat healthy at least some of the time. Sixty-three percent say they try to eat healthy most, if not all, of the time. What’s more, nearly three out of four tell us they’re committed to at least one health, wellness, ethical or environmental attribute among the foods they eat. When it comes to the committed — which, in this context, describes those who purchase something frequently or all the time — age isn’t a determinant. For instance, our survey shows that 25% of adults in each generation are committed to consuming foods with fewer unhealthy ingredients. But as is so often the case with today’s trends, millennials are leading the way. They’re the most committed to natural, ethical and enhanced food products, along with products that support an alternative dietary lifestyle (see Figure 1). Whatever the degree of commitment, consumers are conscious of labels, with 47% reading labels at least most of the time when they purchase a product. That share rises to 53% among millennials. 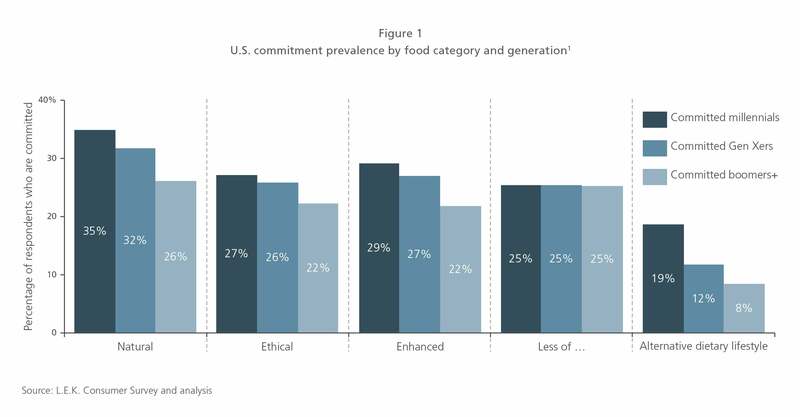 Also important, we’re seeing a shift in the number of attributes that respondents seek out in their food. It used to be that consumer interest coalesced around a handful of on-trend claims. Not anymore. Today’s consumer is a committed or casual (i.e., occasional) supporter of nearly a dozen health and wellness claims — a 20% increase from just two years ago. We’re also seeing a change in the types of attributes consumers expect. In what we’ll call version 1.0 of consumer health claims, attributes of food quality tied into people’s approach to weight management. That led health-conscious consumers to expect foods that were fat-free, sugar-free, and low in salt, carbohydrates or calories. Brands and retailers responded with messages of the “less of …” variety. In version 2.0, health and wellness define the quality of our food. That’s reflected in our survey, which reveals most consumers look for foods that are all-natural and organic at least some of the time. But even those aren’t the most sought-after foods. Which are? Ones with no artificial ingredients and no preservatives. 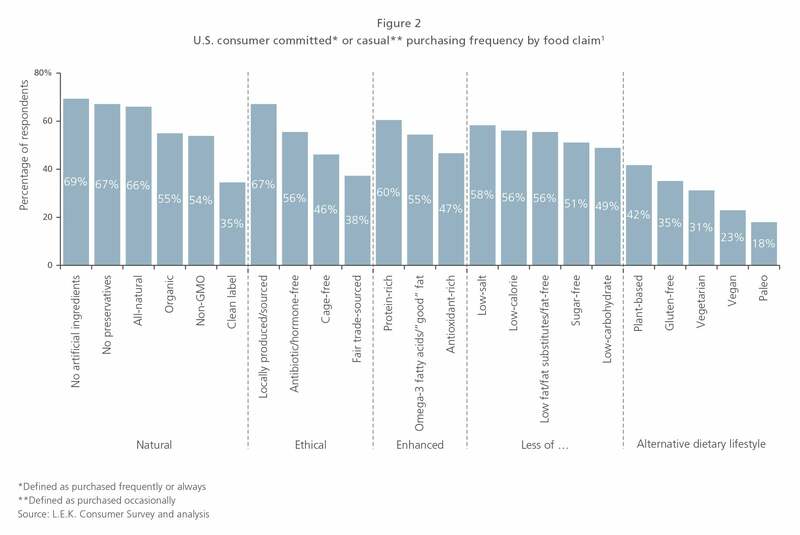 This appears to reflect a growing desire among consumers to move past general claims of “all natural” to more specifically understand the kind of food they’re buying — and being free of added chemicals tops the list of sought-after attributes (see Figure 2). It may seem like hairsplitting to make such distinctions among foods that, after all, appear to share the same basic qualities of lacking toxins and synthetics. But that’s not consumers’ fault. Without an agreed-upon definition for terms like “natural” — the FDA sought public comments on the matter, but has not acted on them — consumers have been left to fill in the blanks on their own. The result is a bevy of attributes and subattributes that zero in on the various ways consumers have defaulted to articulating those preferences. What does version 3.0 of consumer health claims look like? So far, it’s shaping up to include clean labels and sustainability. Interestingly, “clean label” means no artificial ingredients or preservatives — the two most sought-after claims in our survey, even though the term itself does not particularly resonate among this year’s survey respondents. Sustainability, for its part, means fair trade, local sourcing and no genetic modifications, along with claims such as antibiotic-free and cage-free. Terminology notwithstanding, the degree to which consumers care about these newer claims is on the rise. 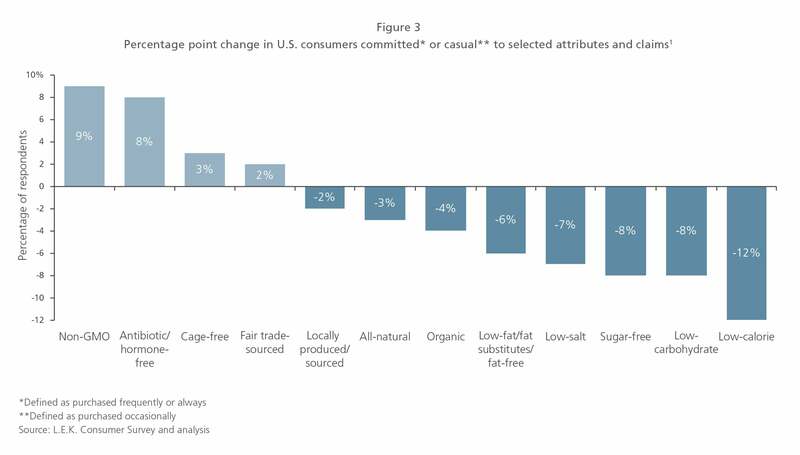 At the same time — and despite expectations of increasingly nuanced information about the foods they buy — the share of consumers with a casual or committed approach to older claims is declining (Figure 3). Realizing this, retailers are looking to brands for products and support that keep them ahead of consumer demand. Producers have responded by introducing version 3.0 products such as Dave’s Killer Bread, an organic, non-GMO product now available in 22,000 stores. Then there’s Applegate’s line of humanely raised, antibiotic- and hormone-free, non-GMO processed meats. At the beginning of 2018, just after earning the stringent Whole30 Approved certification, Applegate saw sales of its hot dog surge at Whole Foods. Meanwhile, food companies have been shedding or tweaking brands known by their version 1.0 positioning. Last year, for instance, Mondelez International and private equity firm Brynwood Partners sold SnackWell’s — introduced in 1992 at the peak of the low-fat craze — for a fraction of the $500 million the brand once earned in annual sales. Meanwhile, Nestle pivoted Lean Cuisine away from its signature diet-meal image, reversing a long-term decline in sales and contributing to a nascent revival of the frozen-food category. For food and beverage producers, delivering on health and wellness claims is no small task. The good news is that consumers are ready to make it worth their while. 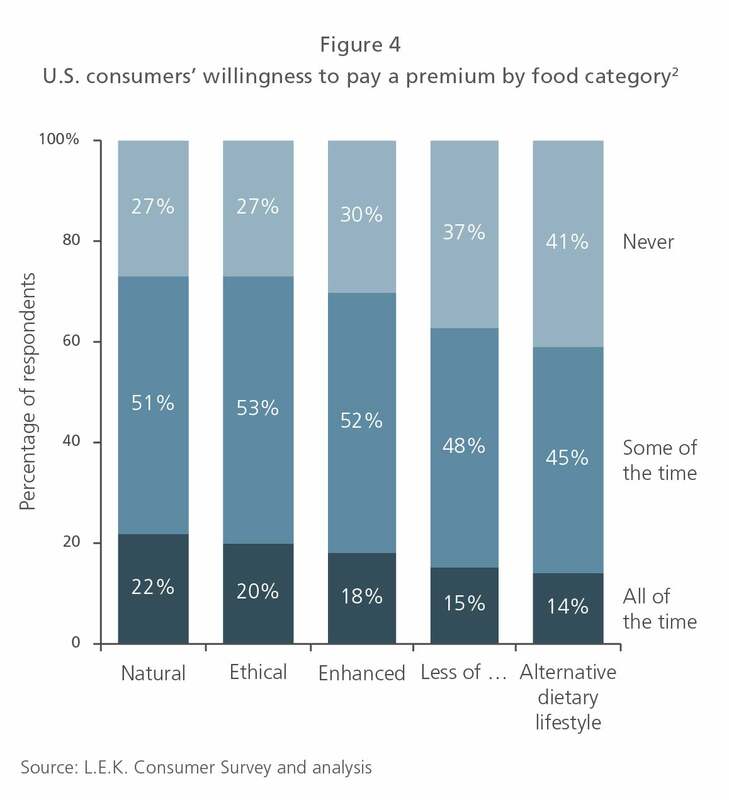 In a significant turnabout from the previous edition of our survey, roughly 60% to 70% of respondents indicate they would pay a premium for food products in the natural, ethical, enhanced or “less of …” categories (see Figure 4). This is an increase of at least 10 percentage points from two years ago. Committed consumers are even more willing to put their money where their mouths are. Among this group, 73% to 86% say they would pay extra for food products with health and wellness attributes that resonate. This is about 15 to 20 percentage points more than in 2016. The results go a long way toward explaining the success of premium products like Halo Top — the high-protein, low-sugar dessert that has become the bestselling ice cream pint in the U.S. – and Caulipower, whose vegetable-based pizza crusts have made it a multimillion-dollar brand. Healthy eating has come a long way since the days of wheat germ and diet plates. Today, it’s in the mainstream, with a majority of customers expecting foods and beverages that deliver on rapidly proliferating nuances of health, wellness, ethics and sustainability. What hasn’t changed is consumers’ delight in products that are indulgent and delicious — with quality ingredients supplanting processed, nutritionally empty ones. The intersection of these desires is where superior pricing and profits await the brands that are paying attention.